Marine display / multi-function / navigation system / control - ECDIS Marine Display Series - Winmate Inc.
Equipment > Marine Electronics > Winmate Inc.
ECDIS Marine Display Series Winmate Inc. In maritime activities and naval forces, rapid, reliable and durable technology is mission critical. Winmate's Marine series products feature industrial-grade design and undergo rigorous testing, going beyond military standard compliance, to ensure safety and performance. 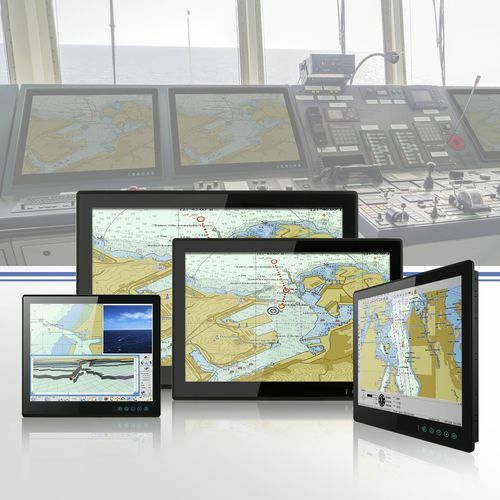 Winmate’s line of multi-touch marine display and panel PCs go beyond that of the standard industrial marine computers with elegant and edge-to-edge designs, rugged construction, powerful performance, and flexible mounting options. The Winmate Marine Displays are adjustable to day, dusk or night mode to accommodate for any lighting situation. The CIE x, CIE y, CIE Lv are measured from 63 color tokens per mode (Day, Night, and Dusk), all of these color settings are calibrated at the Factory to achieve accurate color reproduction referred by IEC 61174. In the ECDIS-color calibrated model, these quick function keys allow instant brightness adjustment to any of the three modes.